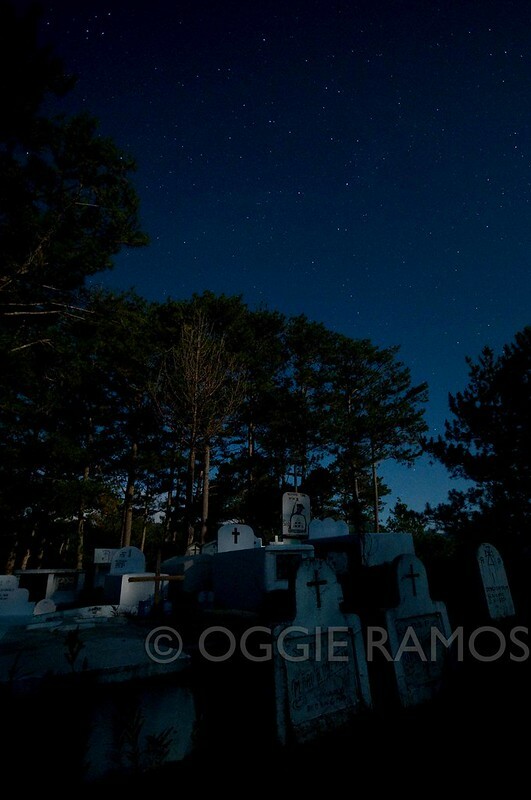 We were in Sagada on all hallow's eve and on a whim, visited the town cemetery at night per chance to shoot the starry sky in a spot relatively free of light pollution. Alas, the moon rose early and bathed the place with an eerie light. No, it was not like a scene from a horror movie but rather a picture of serenity, as if the departed were in repose guarded by the moonlight and kept still by the constant breezes that pass through the mountains and make the pine trees murmur. 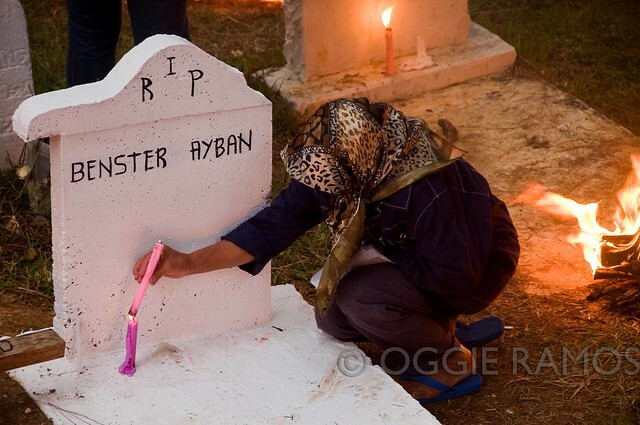 Contrast this to the spectacle of the next day when the Panag-apoy tradition is observed. We missed the mass where the priest read out all the names of the departed and bless the townsfolk's bundles of saleng (pine wood). Heading out to the cemetery on the rise behind the St. Mary's church, it's hard to miss the fiery spectacle -- hundreds of fires burning in unison. The thick smoke makes for difficult breathing at times but it is a privilege to witness this practice which according to Philippine Daily Inquirer traces its beginnings to the early 1900s, an influence of the American missionaries. 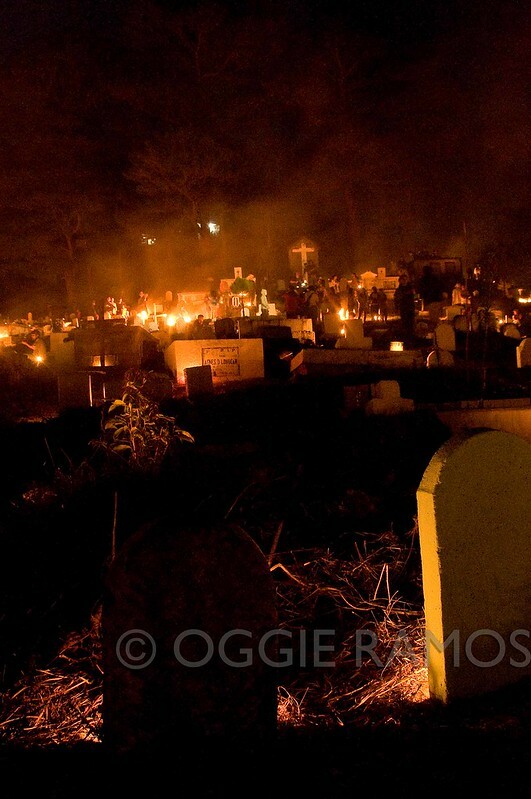 As one of the first Anglican priests officiated over the first Christian funerals, the community used torches made from saleng instead of candles. The practice itself is a mix of Christianity and the Igorot belief that binds the living with the souls of their ancestors. 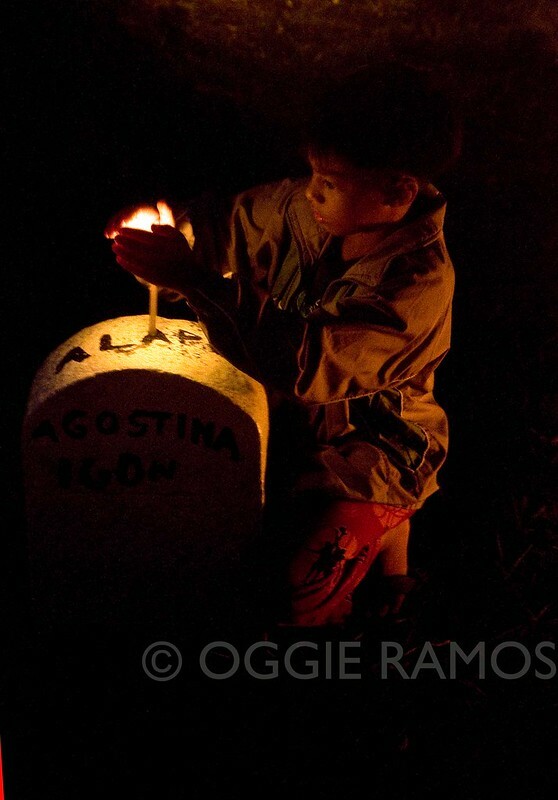 Panag-apoy which means to 'light a fire', is part of that belief, to light the way for the souls of the departed. That the ritual now attracts a lot more guests than before prompted some locals to air their concerns within earshot of photographers and tourists like us that "this is supposed to be a solemn thing, a time to pray not play." She has a very valid point there as her son seems interested in putting up a show for tourists as spectacle has replaced solemnity. We left as soon as dusk settled, leaving the locals to their time of prayer and contemplation. Hundreds of fires were still burning under a cloudy sky, replacing the illumination of the bright moon of the night before and lighting the way for souls and humans alike. Inaantay ko talaga itong post na ito dahil matagal ko na itong gustong ma-experience. Sayang di kami nakasama. Hopefully, next year makapunta uli kami.